On May 26, millions of Americans celebrated Memorial Day with backyard barbecues. While most of our grills were filled with the usual Grade-A meat from local butchers and supermarkets, dozens of restaurants across the country served Kobe-beef burgers topped not with ketchup and mustard, but truffles and foie gras. The price tags on these wallet-busting burgers can reach $175. 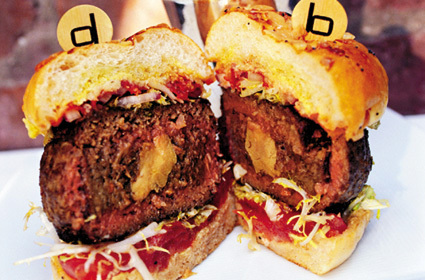 High-end burgers have been around for years (the $17.50 caviarburger at Serendipity 3 in New York City, for instance) but thereâ€™s one chef to thank for the new trend: Daniel Boulud. In 2001, the French chef introduced a $27 hamburger stuffed with short ribs, foie gras and truffles at New Yorkâ€™s DB Bistro Moderne. A few months later, the Olde Homestead Steakhouse debuted a $41 Kobe beef burger; several other New York restaurants then followed suit, unveiling high-end burgers of their own. Some of them didnâ€™t last. 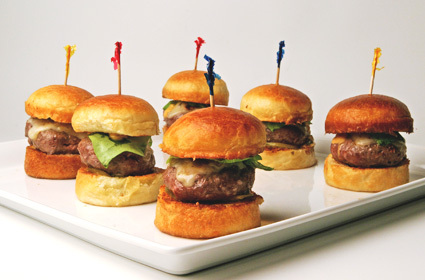 For a time, Le Cirque was offering $24 mini-hamburgers, popularly known as â€œsliders;â€� Laurent Tourondelâ€™s BLT Burger sold a $62 burger made from five ounces of beef. For whatever reasons, both restaurants have since taken them off the menu. Other eateries were happy to take up the slack. And two restaurants, both in Las Vegas, went to the extreme. The Las Vegas branch of Hubert Kellerâ€™s legendary Bay Area restaurant Fleur de Lys serves the FleurBurger 5000: a Kobe beef patty topped with foie gras, black truffles and truffle sauce and served on a brioche truffle bun. No doubt, the burger itself would command a pretty penny, but this truffle overload comes with a bottle of 1990 Chateau Petrus (and a second burger for a guest). The wine, not the burgers, push the price tag to a cool $5,000. Another burger gimmick comes courtesy of the kitchen at the Palms. They'll pair a $6 Carl Jr.â€™s hamburger with a 24-year-old bottle of French Bordeaux. This ultimate combo meals costs $6,000. In most cases, luxury hamburgers are opportunities for chefs and restaurant owners to prove their creative mettle. In Beverly Hills, Spagoâ€™s burger is a comparatively modest $22, but itâ€™s made with Kobe beef, Vermont farmhouse cheddar and a garlic aioli. 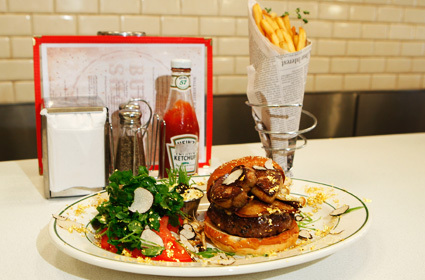 Fellow Beverly Hills restaurant Circa 55 offers another $22 burger topped, instead, with Portobello mushrooms. They may not be the most expensive hamburgers in the country, but they're among the best. Not content to let the West Coast take the lead, New York City-based steakhouse chain Olde Homestead got in the race. 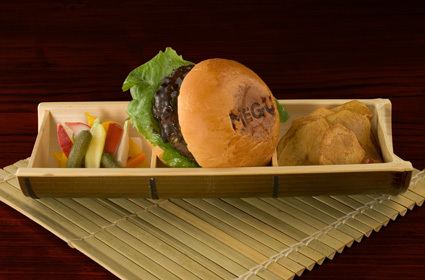 They recently decided that their original $41 20-ounce Kobe beef hamburger wasnâ€™t enough, and introduced an $81 burger. It's made with 14 ounces of 100 percent â€œGrade Fiveâ€� Kobe Wagyu beef â€” with a four-ounce medallion of Kobe sirloin tucked inside. That still doesn't compare to DB's Double Truffle burger, served with 20 grams of shaved black trufflesâ€”and a $150 price tag. (Believe it or not, there's an even more expensive burger â€” dusted with gold â€” also served in New York. What of our compatriots who live abroad? Do they suffer from hamburger withdrawal when barbecue season starts back home? Oh, cry not â€” the luxury burger knows no borders. In Jakarta, Indonesia, the local Four Seasons hotel offers a one-million rupee ($108) hamburger topped with Asian pears, foie gras and Portobello mushroom. Hong Kongâ€™s Steak House restaurant charges HK$490 ($63) for a deluxe 12-ounce burger topped with foie gras and gruyere cheese. Even Burger Kingâ€™s British locations are getting in the act â€” as a publicity stunt, the chain recently announced a $200 burger at select London restaurants (the beef used is Wagyu, and garnished with Italian truffles). Whether they're stuffed with steak, or topped with rare truffles, luxury hamburgers are more than a publicity stunt for many of America's top chefs. They're year-round favorites for the customers who love them, no matter the hefty price tags.